Home » Not Sure If You Should Have Ski Lessons? 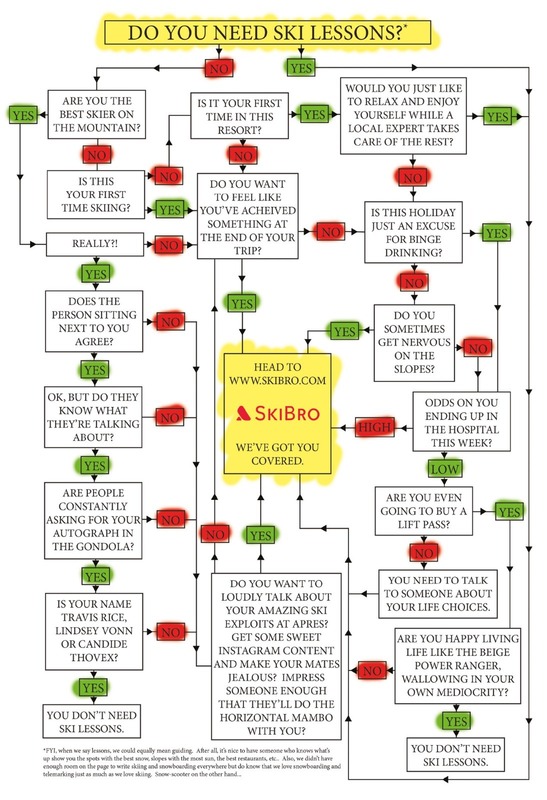 Consult the Flow Chart Of Truth to Find Out! Although almost indescribably fun, skiing and snowboarding can be tricky to learn and nearly impossible to master. The truth is that no matter how good you are you’ll still benefit from good ski lessons or snowboard lessons – after all even Olympic athletes need to have coaches! If you’re a beginner you’ll stay safer and learn to do things properly right off the bat so not only will you improve faster with a lower risk of injury than if you tried to go it alone, you’ll also lay the right foundations for a lifetime of fun. Many people find that even after skiing/snowboarding for years they get stuck on the dreaded “intermediate plateau” and find technical progression and getting out of their comfort zone next to impossible. Luckily, with the right ski instructor or snowboard instructor pointing out small mistakes and making relatively simple adjustments to your skiing/riding you’ll find getting over the hump easier than you thought and will be tackling more difficult terrain – with more style and grace than you knew you had in you – in no time. SkiBro is present in all major resorts in France and Switzerland including Meribel, Val d’Isere, Zermatt and Verbier. Find out more about the resorts SkiBro covers here.